The purpose of this earth cache is to learn about the effects of erosion and weathering in the formation of this geological landmark. PLEASE NOTE: The parking area is open seasonally. However, the park is accessible daily, but closes at dark. One other reminder: Please explore using only marked trails. As always "Take only pictures, leave only your footprints." 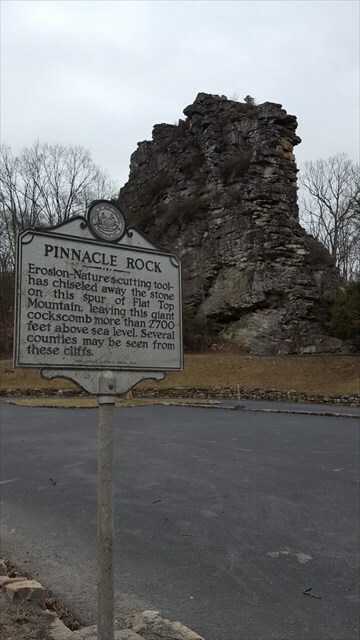 "Pinnacle Rock is located on the south side of U.S. 52 between Bluewell and Bramwell in Mercer County. The impressive formation is on the steep northern flank of the Abbs Valley Anticline, formed millions of years ago during the mountain-building period known as the Appalachian Orogeny. 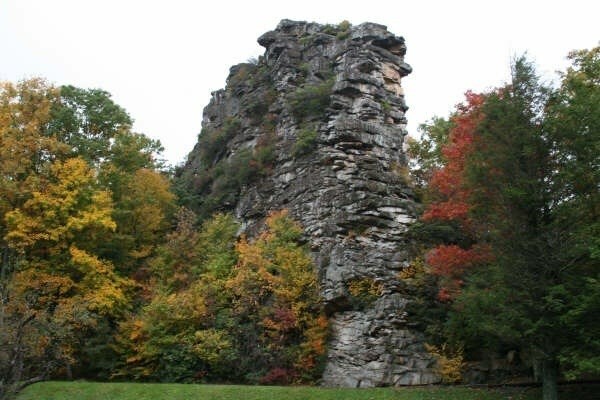 Pinnacle Rock is a hogback formed of erosion-resistant rock known as Stoney Gap Sandstone. The Stoney Gap Sandstone was deposited by southwest-flowing streams during the Late Mississippian geologic period. A prominent local landmark, Pinnacle Rock is part of Pinnacle Rock State Park, a seasonal, day-use facility that opened in 1938. The park includes nearly 400 acres and has a large, rustic picnic shelter and other picnic facilities, and wonderful vistas and overlooks. A two-mile hiking trail connects Pinnacle Rock with Jimmy Lewis Lake, a fishing lake within the park. Rock climbing is allowed with prior arrangement." Reference: Bascombe M. Blake Jr., wvencyclopedia. There are ample picnic tables and outside grills available as well as the featured stone shelter housing seven tables and a fireplace inside. There are nearby restroom facilities adjacent to the stone shelter. There is a paved disability entrance just to the left of the parking coordinates which takes you to the rustic picnic shelter. There is also a small playground area close to the shelter area. The sign by the road reads, "Erosion- Nature's cutting tool has chiseled away the stone on the spur of Flat Top Mountain, leaving this giant cockscomb more than 2700 feet from sea level. Several counties can be seen from these cliffs." The climate through the millions of years has played an intricate role in the erosion of the geology and topography to create the unique features of Pinnacle Rock. Weathering is the gradual destruction of rock under surface conditions. Weathering may involve physical processes (mechanical weathering) or chemical activity (chemical weathering) although it can be a combination of both. Mechanical weathering involves the breakdown of rocks and minerals by physical agents such as rain, frost, wind, and tree roots. Chemical weathering involves the breakdown of rock by chemical mechanisms such as carbonation, hydration, hydrolysis, oxidation, and ion exchange in solution. Weathering can range from a change in color to the complete breakdown of minerals into clay as well as other surface materials. Weathering creates deposits of altered and loosened material called residue. Residue may undergo transportation and then undergo erosion. The process of erosion includes weathering in addition to transportation simultaneously. Weathering is essential for erosion to occur, but interestingly a rock may weather without experiencing erosion. Erosion is the general name for the processes that break down rocks (weathering) and the processes that carry away the breakdown products (transportation). 1. Sandstone: It is comprised of small grains of quartz and feldspar minerals. 2. Limestone: It is made from calcite deposited from the shells of sea animals. Most cave systems are located in limestone bedrock. 3. Shale: It is made from clay sediments. 4. Conglomerate: It is made from large sediments like sand and pebbles cemented together by other dissolved minerals. 5. Gypsum: It is comprised of sulfate material. In order to log this earth cache, please submit your answers to the following questions within one week of logging. Please send your answers by geocaching.com messaging center. 1. Estimate the height of the rock formation. 2. What type of sedimentary rock forms Pinnacle Rock? 3. Explain weathering/erosion as it relates to Pinnacle Rock (ie., give examples of what types of weathering/erosion you observe. 4. What notable geological feature do you notice on Pinnacle Rock when you face north on the observation deck? 5. Compare and describe the rock features you notice around the observation deck to those of the layers of Pinnacle Rock. Please feel free to post pictures of your experience, but this is not a logging requirement. Thank you for visiting and we hope you enjoyed your visit! This earth cache is placed with permission of the WV State Parks Division of Natural Resources (Miranda J. Cope, Programming Services Secretary, www.wvstateparks.com).